If a unit’s equipment and supplies aren’t ready or secure—neither is the unit. That’s why military storage needs to be a major factor for any base. After all, the more warfighters you deploy, the more space you need for equipment and records. The more weapons you issue, the more secure storage you’ll require for them. More space needed doesn’t always equate to more space being available. That’s where Spacesaver Intermountain can help—working with you to organize your facilities for efficient and intelligent use, to make sure your storage can be as versatile as your needs require, and to create safe places for your high-security items. From weapons storage to gear lockers and everything in between, we have an answer. Take a look. 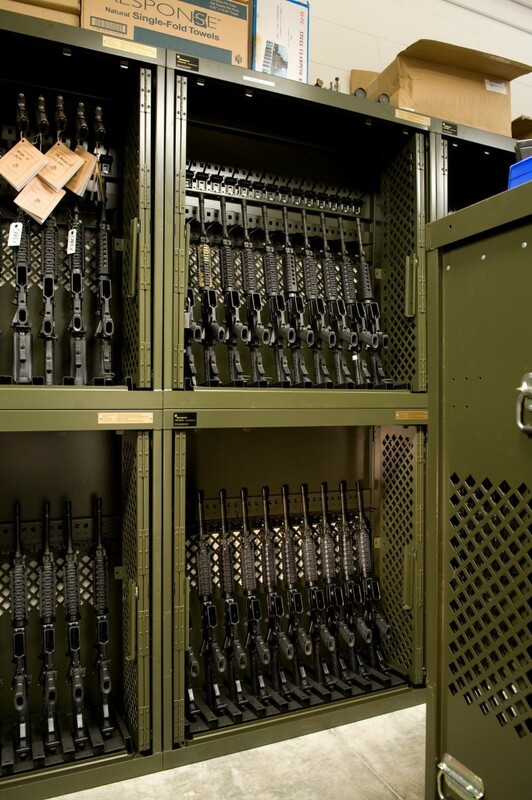 In the Armed Forces, the right storage solution can lead to increased space, but it can also lead to saved time—especially in the case of FLIPLs (Financial Liability Investigation of Property Loss). A FLIPL is used in situations where responsibility for the property loss is in question, or when the amount to be charged is in dispute. We know FLIPLs can be a time-consuming process—a typical investigation can take the time of up to ten soldiers, officers, and commanding authorities—and that doesn’t even count the time it takes to replace the lost property. 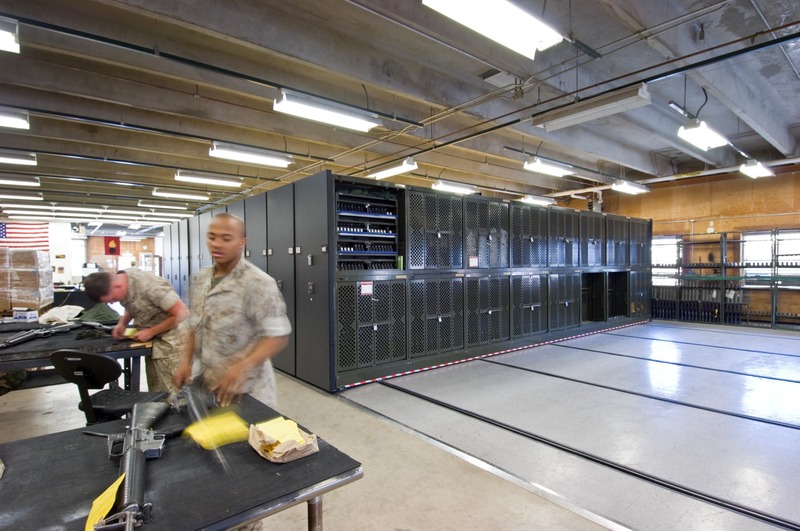 In the case of the Idaho Army National Guard, the base was looking to save space and add efficiency in managing OCIE equipment, so that the amount of FLIPLs would decrease. 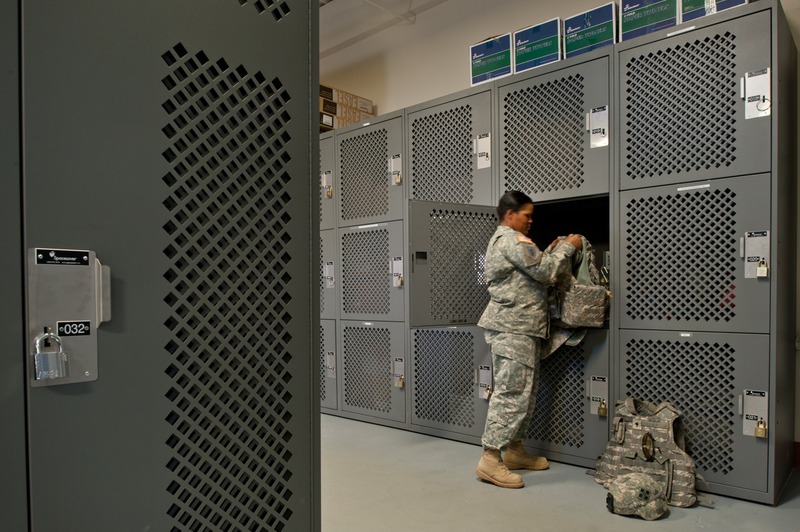 We outfitted them with 592 gear lockers—enough for the 500 soldiers in the unit as well as extra lockers to accommodate growth. 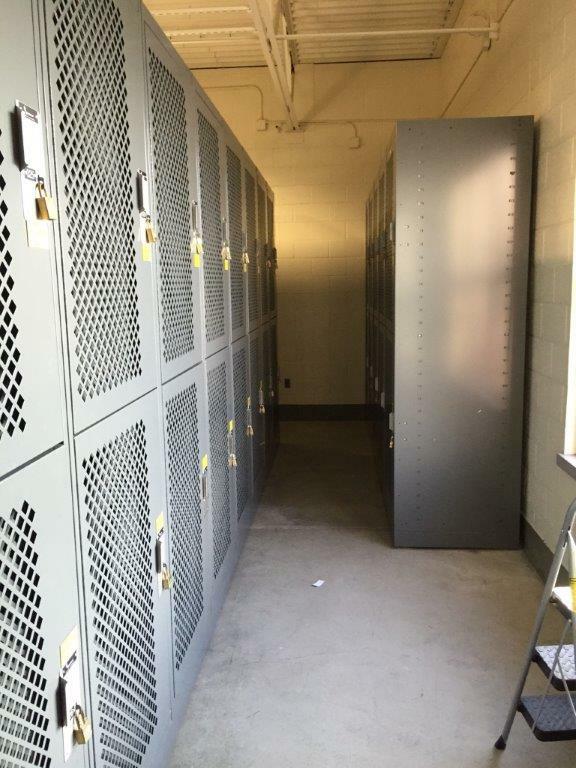 Each locker had enough room for all the gear an individual solider needed—cutting down on misplaced items and decreasing the unit’s FLIPLs. 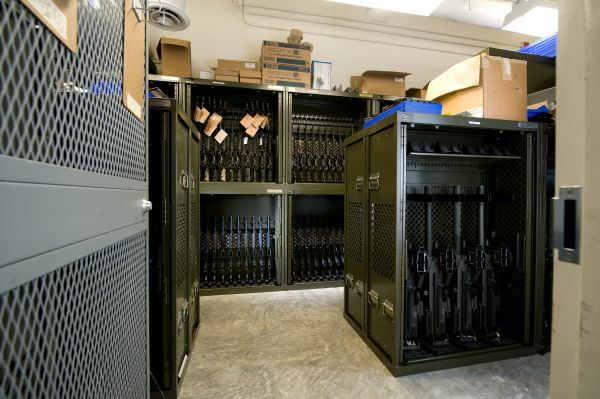 For military police, security forces, firearm training facilities, and unit and battalion armories, storing weapons and other critical gear on one central location helps guarantee its security—and, allows you to issue items quickly and efficiently and streamline inventories. In case of military deployment or training, it’s extremely important to ensure all weapons, tools and spare parts remain in the same condition when they arrive as when they were shipped. 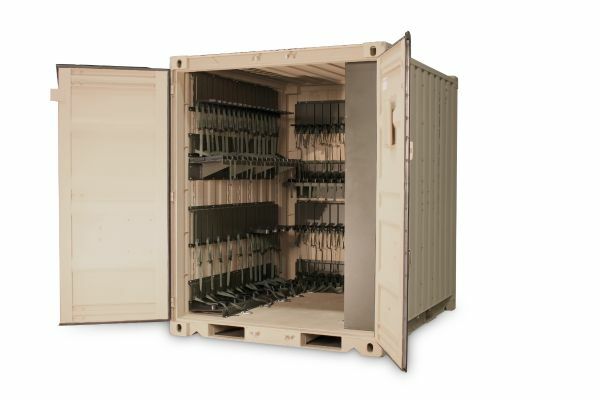 The Universal Expeditionary™ Weapons Storage System (UWESS) is a military shipping container designed to store and ship modern small arms and weapons—and all collateral gear associated with them. 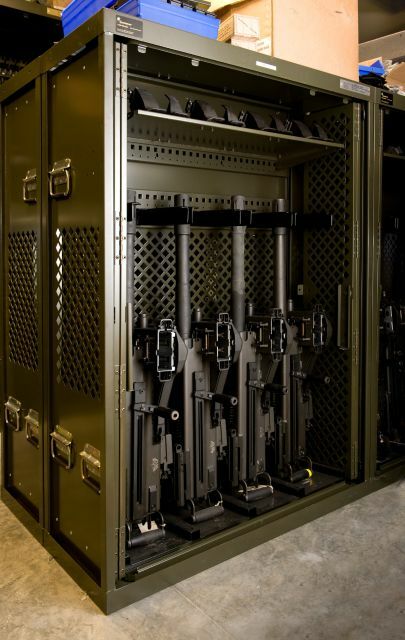 In addition to these two systems, Spacesaver offers a variety of additional weapons storage solutions, including static weapons racks and portable modular storage. Visit our Weapons page for additional information. The Universal Storage Container (USC) was specifically designed with input from parariggers around the world, and is constructed with heavy-duty steel panels and frame—ideal for storing a large number of T-11 parachutes. 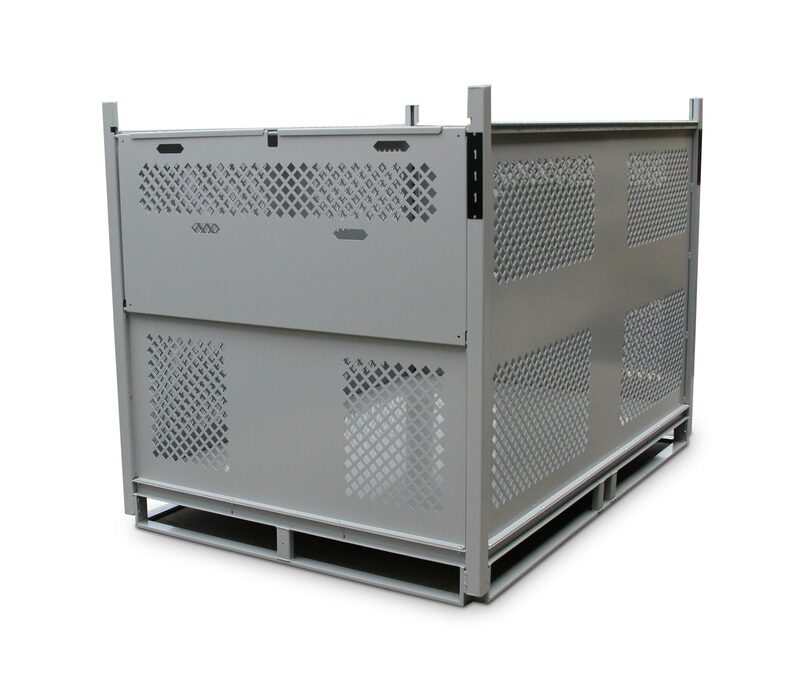 Also optimized for use with Spacesaver’s heavy-duty mobilized storage system, ActivRAC®. 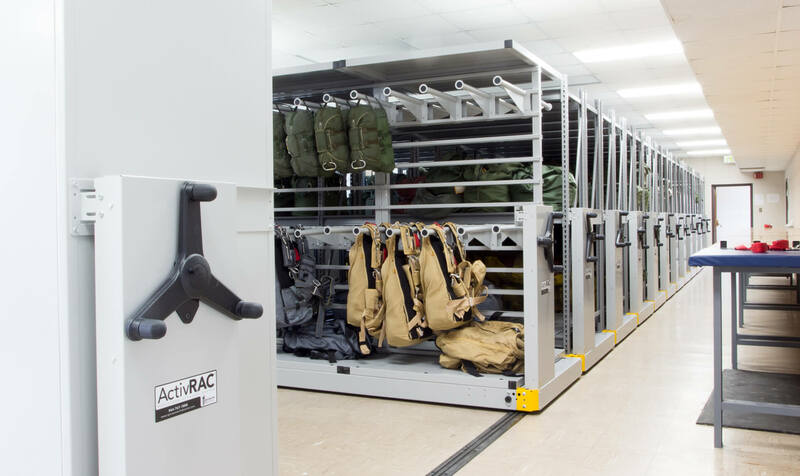 Providing breathable storage without taking up valuable floor space, our Military Parachute Rack storage system features adjustable cantilever arms for a hanging a variety of parachute sizes. Like the USC, the Parachute Rack can also be combined with an ActivRAC® or standard high-density compact shelving system for optimum storage density. 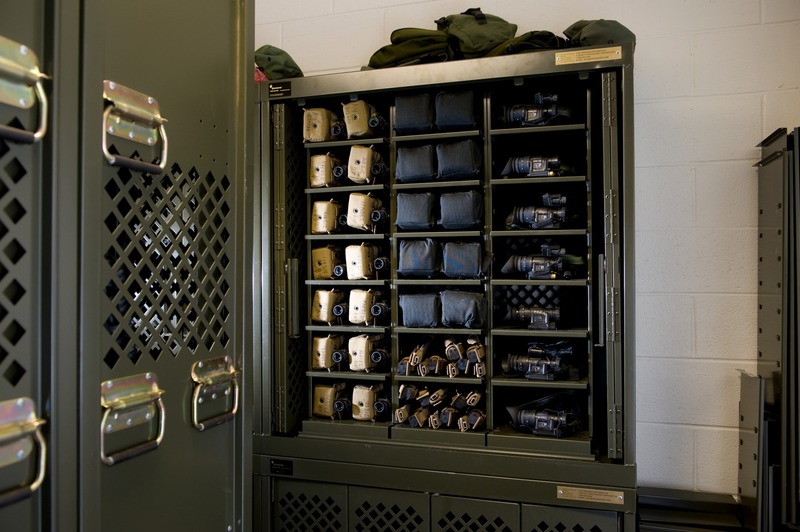 There’s no limit to the amount and size of gear that can be part of an individual solider or unit’s inventory—so there’s always a need for storage that is secure, configurable, and flexible. The modular design of the Tactical Readiness Locker (TRL™) offers a way to achieve all three of these goals—choose from a broad selection of sizes and options for the exterior, and outfit the interior by choosing from a wide range of modular accessories. From CIFs to pararescue facilities and everything in between, Spacesaver Intermountain, along with our Spacesaver partners, have assisted with the design and implementation of thousands of military storage solutions around the United States and beyond. Take a look at the photo gallery below for a sampling of our military projects. If you’d like to learn more, or get started with a specific aspect of your military base, contact us for a complimentary space assessment.